NEW UK Design! Much better than other nets in the Market! See what other customers like you are saying about this prouct below! Q: Hi. I bought something similar off another website but after the first use the velcro hook tape ripped the net and made a hole! what is the point of that? and does your tape damage the window frame aswell? A: Hi, you will not get that problem with the NoentryBug nets, it uses CaptPore tape opposed to Velcro hook tape, so it will remove more easily without strain and therefore less friction to make holes in the nets, your frames will not get damaged with the NoentryBug CaptPore tape, sorry to hear about your situation, please message the website I am sure they will help you. Q: If you ever want to remove the tape, is it likely to damage the painted window frames? i.e. will it rip the paint off with it? A: Thank you for your question, no your paint will not rip off, NoentryBug adhesive CaptPore tape has been tested on window frames that have been painted more than 8 years ago and frames that have had a new coat applied 10 days and with testing no paint was removed from the Frame or damage occuured. Best regards. Q: Hi just wondered on the removal of the net do you have to re tape it or does it peel on and off easily for opening/closing of the windows? A: The NoentryBug uses a specialist CaptPore tape unlike other similar products that use Velcro hook kit and one of the main benefit of our CaptPore tape is the easy removal of the net without tension from the net strands so the tape will stay on the window frame for much longer and not cause tears in the nets. To give you a comparision other similar products use Velcro Hook kit strands are about half a CM in height which latches too strong to the net and if you need to remove it, it immediantly starts to tear away the strands and weakens the tape, the NoentryBug CaptPore tape is only 0.054mm in height which holds the net in place even with a stretch but more easy to remove. If you have any further questions please do let me know. Thank You. A: Hi, yes our new adhesive tape is called CaptPore and will fit to alluminium with no problems, other similar products use Velcro HOOK tape, which uses a cheap process to hold the net but the problem is when you take off the net it is harder to take off as the velcro sticks to the net strands and rips it and because of the force that is needed to take off the net the velcro hook tape starts to peel away more easily unlike our clear CaptPore tape. One final thing is our CaptPore adhesive tape is clear in colour unlike other similar product tapes, so regardless of the colour of your window frame be it mahogony, alluminium, white, etc the tape will litterally be invisible. 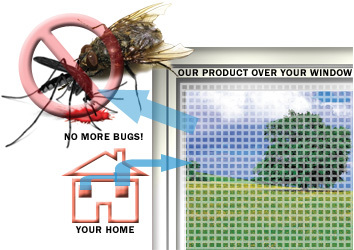 If you have any further questions please do let me know about the NoEntry Bug Window Insect Screen Net. Thank You and have a nice Bank Holiday. Q: Hello, Can you please advise me as to whether the package for sale will be sufficient to fit 3 windows with the following measurements: x2 windows: 110cm drop 68cm width x1 window 37cm drop 50cm width Thank you. A: Hello, yes 1 pack will cover those 3 windows without any problems. Thank you. Q: Hi, will the net keep out moths, small clothes moths? Thank you. A: Hi, yes it will keep out all moths including the small Clothes moths including the cl type smaller moths. If you have any further questions please do let me know. Many thanks. Q: Can the net be cut to size, please? A: hello and thank you for your message, yes the net can easily be cut to smaller sizes to fit more than one window with a standard pair of scisors. Thank you. Q: Hi, My kitchen windows open outwards, so in my case the net would have to be unstuck and stuck again when opening and closing the windows I'd imagine? Would you forsee any problems if the net had to be stuck and unstuck say twice a day? Thanks. A: Hi and thank you for your message, there should be no problems you should be able to open and close the windows and easily have access to your window handle and put up the net in a few seconds. Thank you. A: Hello, 1.) I can confirm with you that customers from Scotland has said it does stops Gnats. It will be a good idea to trial it first just to be safe. 2.) Yes I get quite a few emails from Smokers who said they are surprised that the nets still stay on as they need to take it on and off as they smoke near the windows. If you have any more questions please do let me know. If you do decide to purchase the item can you please let me know what area you are in and if it kept the Gnats out as in certain areas have differnt kind of Gnats so I can provide a better customer service to customers. Thank you for your message. Copyright NoEntryBug.net, Noentry Bug & No Entry Bug, All Rights Reserved.